I was asked to write an article on my “Passionist Blanket.” I am not a writer, or literary talent, so you will have to bear with my effort. You are probably thinking “my blanket” is a descriptive term to tell you how the PFGM and the Passionist Charism has enveloped and enhanced my life, and the lives of people round me, like a “spiritual blanket.” If you are, you are not entirely wrong – but “my blanket” is actually a real blanket. It is made of wool. 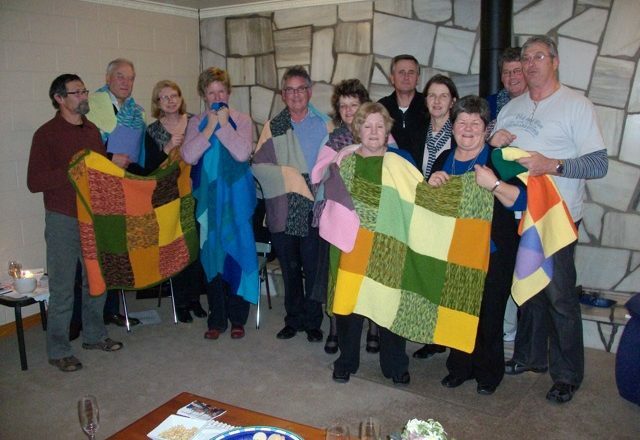 It was knitted in patchwork squares and sewn together. It has covered me every night for over 7yrs. Therefore, ‘what is she on about you?’ you ask. 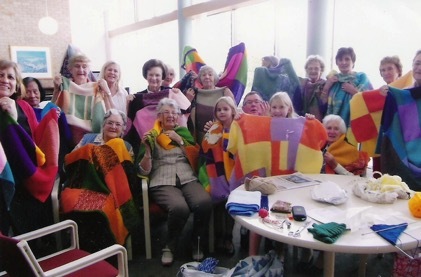 Well I wrote several drafts of this article, about my “woolen blanket,” but the story never seemed to make sense until I incorporated the spiritual blanket aspect as well. To understand you will need to know a little about me and my Passionist story for context. I am 69. Married to a Catholic man, Bill. We have four children and 8 Grandchildren. At age 33 I was diagnosed with multiple sclerosis, a degenerative illness of the central nervous system. I was able to walk until the year 2000 when I became reliant on an electric wheelchair for mobility and now need considerable personal care assistance. We live in Christchurch. Our PFGM story began in March of 1993, (I was still mobile) when like many of you, we were asked by our PP to lead a “Passionist Family Group,” a task we enjoyed and felt so blessed to perform for nearly 12 years, before passing the baton on mainly due to health reasons. By then we had joined the “Christchurch Passionist Companions group,” a group we are still active members of today. We have continued to attend all PFGM formation days held in Christchurch. All told we have been Passionist Family members now for over 25yrs. The first two, are examples are of celebration sharing, and the other two are examples of love and support; principles that we consider are the pillars of the PFGM. 1. Our original group numbered 14 families, with 27 adults and 24 children, including two Korean families. The Korean families enriched our group and formed us into a new “family for all” very quickly. We helped each other learn and understand much about each other’s culture. One thing we learnt was that their first and most important birthday celebration is to celebrate the milestone of a newborn reaching 100 days of life: milestone for them because many of their children don’t live this long. This was a very special celebration, and an honour to attend. 2. One of our members owned a rural property. Each “Guy Fawkes” day we would gather there to celebrate the event. We would have a picnic dinner, rides on the farm quad bike and at sunset we’d light a huge bonfire, and let off our fireworks. It was a great family event, and always memorable for different reasons each year. This event always got maximum attendance and showed we were there for each other to celebrate when appropriate, as well as being there to give care, love, and practical help when needed. 4. The years passed, and it was September 2010. Canterbury experienced a magnitude 7.1 earthquake that was so frightening! During the next 24 hours we had in excess of 500 aftershocks. Five months later we experienced a magnitude 6.3 earthquake that took 185 lives and caused billions of dollars’ worth of damage. By September 2012 we endured 11,200 earthquakes above 2.5 in magnitude. The region and its residents were in financial, physical, and mental distress. Physically disabled persons such as myself, cannot run from the danger, or take refuge like the able-bodied. Therefore, for us the earthquakes were even more frightening and dangerous (still are). In June 2011, the South Island Director of the PFGM (Aileen Straight) arrived at my door. She was carrying a patchwork woolen blanket and told me it was for me. 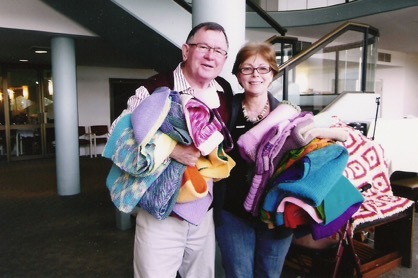 It had been knitted and stitched together by a group of Passionist women from Australia, to be handed out as comforters to Christchurch residents who would benefit from them. Without the PFGM that encourages, teaches, assists and support us to help and be there for each other, in the ways listed above and in so many other ways, I would never have received my “Passionist Blanket.” I would not have received the peace joy and comfort it has provided me. To me, my blanket is a daily reminder of the Passionist Charism. How when we practice it correctly we show the love of Christ to each other, and remember the love Christ has for us too. My blanket reminds me of my whole Passionist journey from 1993 until today. It reminds me how the PFGM and Charism has helped me and so many other families, by enveloping us in a “blanket” of love, care, concern, and help, both practically and spiritually. I feel so humbled and privileged to have received my Passionist Blanket. My grateful thanks and appreciation to those pictured in the three photos attached. 3. 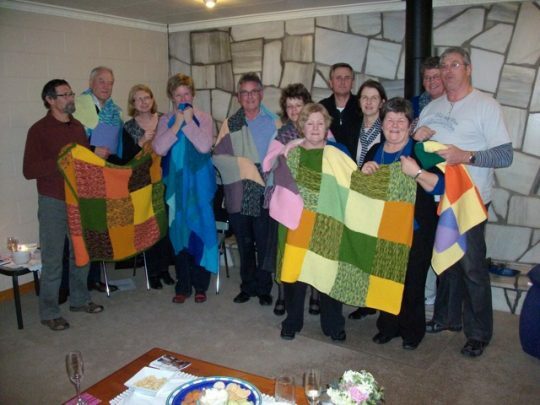 The Christchurch PFGM Parish Coordinators who distributed the blankets to the recipients. PS: Daphne’s husband Bill, was forced to retire from the Police force around the same time Daphne needed her wheelchair. This was the result of a shocking attack against him while on duty.